16th August 2012. Our Gift Cards are the perfect Father's Day gift; new edition product releases; new EOTrackMe documentation; first winner of the August Thermal Wear announced! Get it now in the ExplorOz Newsletter. The ExplorOz Online Shop has e-Gift Cards available, with prices starting at only $20. Give Dad the gift to choose from hundreds of great travel products this Father's Day (perfect for last minute decision as you'll receive your e-gift card via email within 1 day). Victoria's High Country is the ultimate destination for Spring/Summer 4WDrivers. Hema have just released this new edition of their extremely popular atlas and guide to the region, now with a section of "Top 25 4WD Trips" to help you get the most out of your next trip. Get your copy from the ExplorOz Shop here. From selecting your rig to how to tow it, to navigation while on the road - this is perfect "all in one" book for anyone planning on touring Australia with a caravan, motorhome, campervan or camper trailer. Get your copy from the ExplorOz shop here. For ExplorOz site users with a Facebook account, you might be interested to know this… If you use the Facebook login to ExplorOz, your ExplorOz Blogs and ExplorOz Forum Threads will automatically appear on your Facebook profile page too, which is kinda neat! But, if you prefer to keep things separate, just continue to use your ExplorOz login by entering your email address & password (and using the Remember Me function for auto login). It’s up to you. 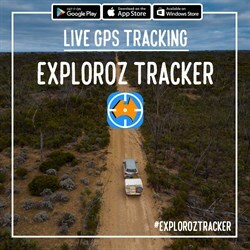 ExplorOz has its own Facebook page, which has a direct feed of all Forum posts & blogs - https://www.facebook.com/ExplorOz. We allow people to post comments into these, so this means some people posting on our website will get comments on our Facebook page (but might not be aware of it). To ensure you never miss out on these responses (which don’t show up on the ExplorOz.com site) simply LIKE our ExplorOz Facebook page – this will add ExplorOz to your Facebook news feed so you can quickly glance at what’s being posted. We haven’t cross-linked the FB responses back into ExplorOz though. Let us know your thoughts, if you think we should. Simply by purchasing an item from our new range of Rammite Merino Wool thermal clothing range from our shop, Member - Des Lexic has won a Rammite Long Sleeve Crew thermal shirt worth $80. We still have three more up for grabs so don't miss out - see entry conditions here. Following the recent upgrade to the EOTrackMe system pages on ExplorOz, we have now updated all of the documentation files to help you understand what it does, how it works, and how you can use this unique tracking system on your next trip. Westprint Maps have released the 2012 edition of their Outback Tracks mapping, on CD for only $80! Get your copy here. Looking for canvas repairs, alterations or custom canvas gear?